WASHINGTON — Led by the survivors of the massacre at Florida’s Marjory Stoneman Douglas High School, a record-breaking number of students and adults filled Washington’s historic Pennsylvania Avenue in massive show of support for strong national gun control. Aided by survivors of the elementary school shooting in Newtown, Conn., and by Dr. Martin Luther King’s granddaughter Yolanda, and worldwide by at least 800 other marches, participants at the March For Our Lives demanded a ban on weapons of war in schools, in the nation’s big cities, in movie theaters, churches and other gathering places along with other tough gun control measures, such as automatic background checks. They also pounded on politicians who bow to the gun lobby and denounced the National Rifle Association for its rabid anti-gun-control stance. “NRA kills kids,” one hand-drawn sign said. “NRA supports child murder,” another read. “Hey, hey, NRA. How many kids have you killed today?” was an occasional chant during the 6-hour-long event on March 24. 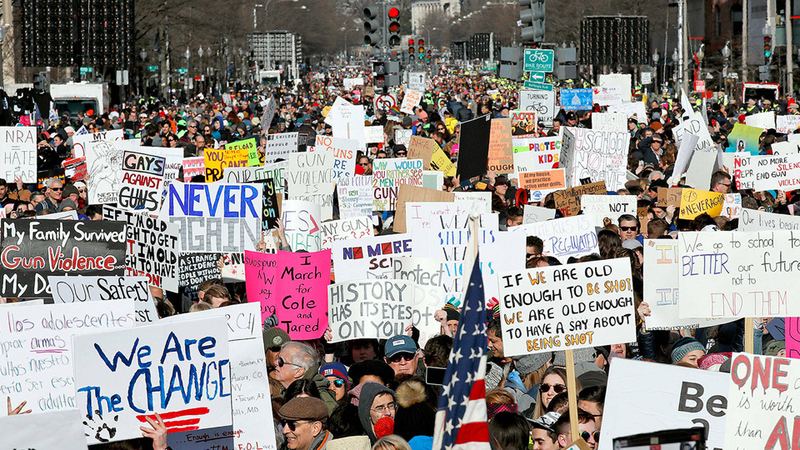 More than 500,000 people – estimates ranged up to a million — carrying handmade signs for gun control, against the rabid right-wing lobby or both, packed Pennsylvania Avenue from the foot of Capitol Hill for the next 12 blocks. If the politicians don’t heed the marchers and enact strong controls, including a ban on AR-15 rifles such as the one used at Douglas, the protesters had a solution through a repeated chant: “Vote them out!” The real solution the student speakers repeatedly urged is for them, their colleagues and their families to register, to vote, and to make strong gun control the issue this fall. “Don’t re-elect NRA pocket pols,” a hand-drawn sign urged. “If people aren’t voting, if people aren’t talking to their representatives, there’s not going to be any change,” said Salisbury (Md.) University student Christina Helowicz said in an interview. “I came wanting to support these amazing kids,” added attorney Jim Kaminski of Gary, Ind., son and grandson of Steelworkers there. “I know what it’s like to have gun violence every day. When I was growing up, Gary was the murder capital of America. It’s got to stop.” His sign read “Gary/NW Indiana. Not one more — anywhere.” Some 40 teenaged students from Baltimore, the nation’s current “murder capital” per person, also marched in D.C., National Public Radio reported. Besides the Douglas High School marchers, others came from as far away as Georgia and Texas, determined to show the rest of the nation that the South, too, wants strong gun control. “I come from a very Republican, conservative family, and this is just incredible, because I’m going against my entire community, too,” said Zack Maddox of Winder, Ga., in an interview. 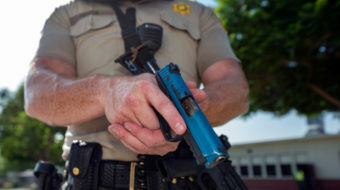 “Gun control is a very real issue down in Texas and we’re here to bear witness to that,” added his colleague, Catherine Reynolds, of Fort Worth. Her sign read “Texans for gun control” superimposed on the state’s Lone Star flag. That Douglas massacre, in Parkland, Fla., the latest since Columbine High School in Colorado in 1999, touched off the student-led gun control movement which produced the marches in D.C. and nationwide. 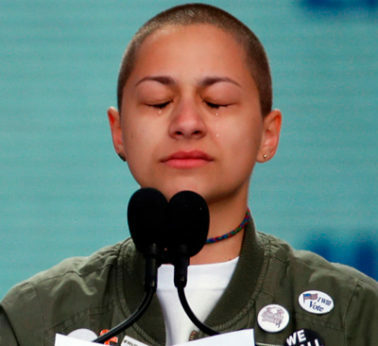 Emma Gonzalez, a Douglas massacre survivor who has been among the leaders in speaking out for strong gun control and organizing the marches, led the speakers, too. 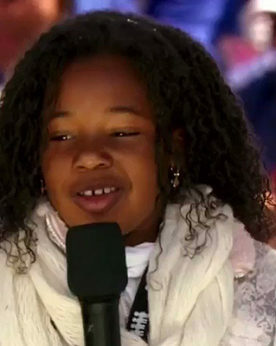 Reading the names of her slain classmates and teachers, she then hushed the crowd and with tears streaming down her face stood silent for six minutes and 20 seconds. That was how long it took the Douglas murderer, Nicholas Cruz, to kill the 14 students, two teachers and the school’s athletic director with his AR-15. Kasky ended by leading the crowd in a heartfelt “Happy Birthday” to massacre victim Nicholas Dworet, who would have turned 18 on March 24. “Parkland is my home,” said student Jacqueline Torrin. “My hometown needs the alliance of other communities to spread this message.” But she also reminded the crowd that other communities – notably communities of color – face gun violence daily. 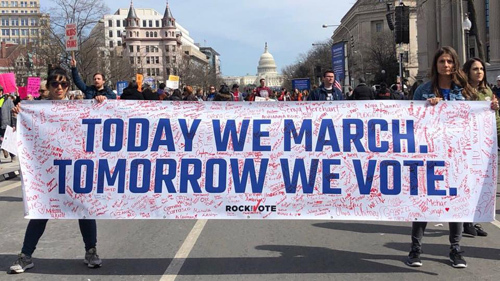 “This is the time, by the right to vote, to show something to those who say our lives are not more important than their guns,” Matthew Soto said. More than 400 students, parents, teachers and survivors of the Newtown massacre in Sandy Hook Elementary School of 20 children and six teachers joined the D.C. march. Those teachers were union members, too. The other communities, around the U.S. and overseas, got the point of the D.C. march. Some 800 marches occurred, as near as the D.C. suburbs and as far away as Paris. Parkland, site of the massacre, saw 30,000 march. The city houses 31,500 people, latest estimates say. Catherine Wilson, whose sister died in a 1996 school shooting of 19 people in Scotland – a rarity in the United Kingdom — read a letter of support for the U.S. marchers at the Paris rally. “I don’t understand why owning a gun is more important than seeing your grandchildren grow up, or feeling safe when you go and watch a film in the cinema,” Wilson said, according to Cable News Network. Celebrities joined the marches, too. CBS reported Paul McCartney was among almost 10,000 marchers in Manhattan headed for Trump Tower there. In his speech, he evoked the late John Lennon, slain by a handgun years ago. Singer Miley Cyrus was in D.C. When the main D.C. march ended, several thousand took their message around the corner to the White House. They made clear they’re also keeping an eye on its occupant, GOP President Donald Trump. He’s been mostly anti-gun control, even after the Valentine’s Day massacre at Douglas. It wasn’t just students speaking out. Marchers interviewed were unanimous in declaring the nation must shift course on gun control, to protect not just themselves, but their kids. “I’m a very concerned parent,” said Angela Hall, a middle-aged African-American woman from Loudoun County, Va. “We deserve to be safe, to go to church, to watch a movie,” she added, referring to massacres in churches such as one in Texas, and theaters, such as one in Aurora, Colo., five years ago, killing 12. “We need to stand up to the politicians who respect NRA money more than our students right to survive,” one marcher from Springfield, Va., said. “I grew up not having been harmed by gun violence. 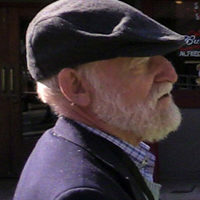 I think everyone deserves that chance,” added Jack Fenton, a resident of western Massachusetts. They also took strength from the students, at Douglas and elsewhere, who are leading the crusade. Teachers unions and their members are strong allies of the marchers, with American Federation of Teachers (AFT) President Randi Weingarten, a middle school teacher from New York City, and National Education Association President Lily Eskelsen-Garcia, an elementary school teacher from Salt Lake City, enthusiastically endorsing it. The Lafayette Park crowd, opposite the White House, took up the “Show us what democracy looks like! This is what democracy looks like!” chant, first popularized by the labor movement. Union members were also scattered through the D.C. march, with two retired teachers, AFT members from Baltimore City, drawing attention with their handwritten sign: “There are better ways to reduce class size,” than, obviously, massacres. Several dozen AFL-CIO staffers, working in federation headquarters on a Saturday as hosts for an NAACP youth conference, went to join the procession downtown. Out-of-town high school students rendezvoused at the National Education Association building. Dan Savino, a Montgomery County (Md.) Education Association union rep from Poolesville, Md., High School, also made the linkage between gun control and politics. “We’re working to put people in office who will make the change we need,” he said. Many also came for, or with, their kids, with hundreds in strollers festooned with pro-gun control or anti-NRA signs. “My life is more important than your hobby,” read one carriage with a toddler in it. Savino brought his elementary-school age daughter. Another marcher held up a sign: “My 9-year-old sister is afraid to go to school.” Washington-Baltimore Newspaper Guild Executive Director Cetewayo Parks brought his pre-teen daughter.